We are located at 701 Westmont Drive in the Haymount section of Fayetteville, between Fort Bragg Road and Bragg Blvd. Where do I go once I arrive at Snyder? Look for the covered walkways and a friendly greeter! You’ll find visitor parking near both. 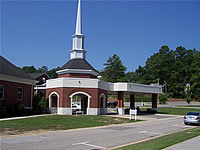 The Westmont Drive entrance is located to the left of the sanctuary. If you have small children who will need care during worship, this may be your better entrance choice. The nursery is located on this side of the building. Just enter the children’s area under the covered driveway and one of our greeters will help you find your Sunday School groups and places for worship. Enter the sanctuary for the 11:00 service through the columned porch. The Rockledge Drive entrance is located on the north side of the building. 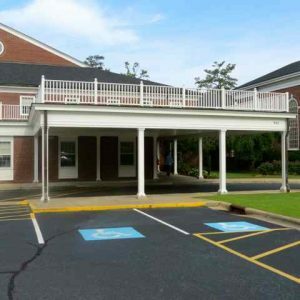 Enter the building under the covered walkway to the Gathering Hall where Greeters will help you find your way to Fellowship Hall for the contemporary service (8:40 AM) or to a Sunday School Class (9:45 AM).